You can travel by selecting a location on the map. 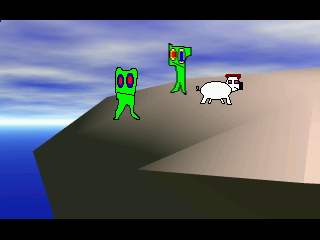 Select the cliff (klippe) to find a lab technician, his colleague and a pig. They are researching the blood found earlier. Talk to all and one of them will give you an AUDIO CD. Select the map in your inventory and select the Giant (Riese von Maradam). Talk to the giant and he’ll give you a PICTURE of a sea snake. Give the audio cd to the giant and receive BATTERIES in return. Select the map again and go back to the cliff. Give the picture to the lab technician and he’ll tell you it must be from X. He advises you to go to the green meteor to investigate. Use the map in your inventory and go to the green meteor. You’ll meet Hevlop. Talk to him, he’s the timetraveler. But he has little time and wants you to take his CUP. Look at the machine. There’s pig food inside. Use the cup to take some PIG FOOD out. Give the batteries to Hevlop. He gives you a BOX and wants to take off but the worm runs off with his x-ray specs. Look at the map and select the cliff again. Give the pig food to the pig and you’ll receive a paper with PASSWORD. Use the map and select Malsi’s hideout (Versteck von Malsi). Give the paper with password to Malsi and you get the X-RAY SPECS. Then you’ll travel to the past. Pick up the box that fell from your pocket. Then you’ll hear a voice. Walk to the north to see who’s behind the voice. Since you can’t understand the ancient language, a universal translator will be used. Talk to the stranger. Try to talk to him but there’s a language barrier. Ask for Hevlop but the stranger doesn’t understand. Walk to the north. Look at the column and the colour portal. Behind the column is a NOTE. You’ll pick it up. Walk to the south and give the note to the alien. He’s happy because it’s a love letter. He’ll help you with your transport and suddenly you’re on a roof with Hevlop. Talk to Hevlop and suddenly he jumps over the edge. On the other side of the wall is a difficult path to cross. All you can do is follow him. Go with the green cross to the other side without touching the red dots. On the other side go south over the wall again and talk to Hevlop. Tell him you need proof and he suggests you make a picture of the portal. When that’s taken care of use the box on the portal to settle things down and you can continue your investigation.